The Isle of Capri Casinos (IoCC) is an American gaming company originally headquartered in Missouri, St. Louis, operating casinos, entertainment and hotel facilities across the USA. It operates in seven US states attracting 13 million yearly visitors to its 14,000 slot machines, 350 table games, 2300 hotel rooms and 36 restaurants. The company was acquired in June 2017 by the Eldorado Resorts gaming and entertainment company, which reported a second quarter revenue of more than US $400 million in 2017 and now employs 14,000 staff. – BYNDERMarketing communications for the gaming and entertainment industry is a fast-paced area of the business requiring quick response times and roll outs of marketing initiatives. Therefore, the production of all marketing collaterals need to be tightly coordinated to attract casino customers seeking the best gaming and entertainment experience. 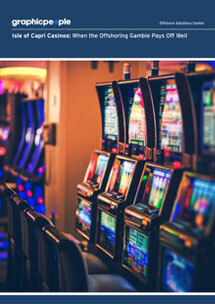 The Isle of Capri Casinos (IoCC) were producing high-volume, diverse marketing collaterals for all of its 14 properties across the US using different vendors. This complex and decentralized production landscape, coupled with the challenges of synching time and output for simultaneous product launches, provided an opportunity to improve production efficiency. Wunderman New York pitched a onshore-offshore blended model to IoCC for creative and production work, which would centralize print and digital production in one location. IoCC partnered with the agency, happy with a solution that would offer better quality, efficiency and consistency of production across all of its 14 properties. Production work was first offshored to Wunderman’s Buenos Aires production hub in Argentina, with the Wunderman Dhaka hub also providing some support. Within six months, in an effort to further boost efficiency and consolidation efforts, all production work for the IoCC properties was transitioned fully to Dhaka from Buenos Aires. Centralization of all marketing collaterals production from a complex, multi-vendor production process, integrating workflow processes for all properties, and print and digital production; simultaneous versioning (adaptation) and production of 1000 units of 30+ types of marketing collaterals for 14 casino properties, across print and digital media; real-time synching with client’s US offices. Transitioning complex production work of 14 different casino properties across multiple media into a centralized system in another continent requires high quality project management resources. Real-time synching of Dhaka and US times was an immediate challenge faced by the Wunderman Dhaka team. Given the diversity and volume of production, requirements from each of the 14 casinos had to be individually transitioned into a single workflow system first. Production of print and digital media also had to be synched and coordinated with marketing teams in the US to ensure seamless roll outs of high-visibility promotions. This required setting up a strong communication system involving all project and client teams and simplifying the processing of briefs and feedback. – Centralized production hub streamlined communications, QC, and optimized resource allocations. – Shortened time to market utilizing time zone advantage. – Time zone ‘disadvantage’ turned into advantage for client, ensuring continuity of work during both US and Dhaka times. – Quick adaptation to changing work volumes – freeing up or deploying additional resources as needed – improved efficiency.The Dhaka team’s long experience in dealing with clients across time zones and complex projects helped to centralize all production activities from the 14 casino properties under a single project management system. This centralization immediately improved coordination, consistency, reporting and resource allocations across print and digital production. The team turned the earlier time zone ‘disadvantage’ into an advantage for the client, dividing client communication and production activities into day-night time slots. Dhaka would communicate with the US with real-time updates during US business hours and resume production during Dhaka business hours using project teams in shifts. Each casino property’s work was transitioned individually to Dhaka first, with team members applying the learning experience of the previous transition to the next one, until all 14 properties were centralized as one large project. Powerful project management tools like Jira and the ability to quickly create customized work flow processes helped ensure quick turnaround times across print and digital production. Real-time resource allocations could now be seen easily and this ease of reporting also enabled the client to optimize marketing budgets for future promotions. Project teams at the Dhaka hub could be quickly staffed with more or less team members according to the volume of the work and this flexibility helped the client optimize production costs on different campaigns across the 14 properties. A month after transitioning all of the production work, the Wunderman Dhaka team produced 1,000 production units of over 30 different types of marketing collaterals in print and digital media for all 14 casino properties. Print materials included over 500 production units of posters, cool cards, booklets, decals (including vehicle decals for casino vehicles), kiosk images, branded stationery, scratch cards, table game signage, and a host of other marketing collaterals. Digital marketing communications included 261 production units of attractive monthly newsletters and animated banners. Centralized production resulted in better reporting, improved transparency and visibility of resource allocations for each marketing campaign. It also streamlined the briefing process under a single system making information flows clearer, compared to earlier practices where client briefs would be sent in variable formats. “When you bring everything under a single project management system, efficiency is increased and everything can be measured and optimized from a single place” explains Masudur Rahman, Wunderman Dhaka’s Head of Offline Production. “This is an essential aspect of offshoring and a big advantage to our offshore clients”. The Dhaka hub’s internal client was equally pleased with the results. “It was amazing to see how the project was managed and everything was ready for the client on time. A big thank you to the Dhaka team for making these miracles happen!” says Jennifer Colon, Wunderman’s Regional Marketing Manager in New York. © Wunderman Production Dhaka 2017. This case study is for informational purposes only. Wunderman Production Dhaka makes no warranties, express or implied, in this case study.